After going through puberty, discovering sexuality, learning how to cook, taking on literary classics, trying their hand at entrepreneurship, and exploring the meaning of life, Morro and Jasp now approach a new giant life milestone with hot ideas and cold feet. 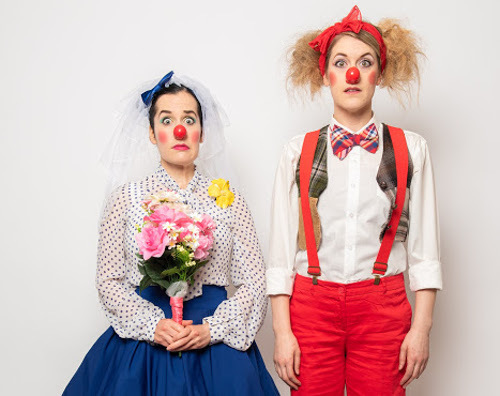 Join Morro and Jasp as they say yes to the dress, try to handle the stress, and attempt to throw a big fat clown wedding without throwing up. But does saying “I Do” to someone new mean saying “I Don’t” to each other? Can they even survive this new chapter of life without the person who has always been by their side? After this, can they still be Morro and Jasp? The Dora and Canadian Comedy Award winning duo take on one of life’s biggest juggernauts. The team behind MORRO AND JASP – Heather Marie Annis (Morro), Amy Lee (Jasp), and Byron Laviolette (Director, Dramaturg) – have created 10 full-length shows over 13 years, including sell-out hits Morro and Jasp do Puberty, Of Mice and Morro and Jasp, Morro and Jasp: Go Bake Yourself (the play that inspired the Award-winning cookbook Eat Your Heart Out with Morro and Jasp), Morro and Jasp: 9-5, and Morro and Jasp in Stupefaction. MORRO AND JASP also performed at the Edinburgh Fringe Festival in 2015 to rave reviews and sold out houses. This is Morro and Jasp’s tenth show at the Toronto Fringe Festival. This venue is barrier-free. Designated accessible seating is in the middle of the auditorium.